Not exactly what you have in mind? Customize your itinerary. Inquire. Day Trip to Florence Inclusions: private tour guide, entrance tickets to Accademia museum, train tickets, private transfer to train station, taxes. Consider a Rome day trip to Florence and tour Florence with an expert guide. You may take the train from Rome to Florence with our help. We’ll get train tickets for you and take you to the train station in Rome, where you’ll get on a fast train to Florence. Upon arrival, you will meet our expert tour guide at the train station and begin the Florence tour that includes a visit inside the Accademia museum. Your excellent guide will take you to see some of the world’s greatest art and architecture. Some of the highlights of your Rome day trip to Florence include the Duomo square to see Duomo (Cathedral) and the famous Brunelleschi’s Dome, the Baptistry’s Gates of Paradise, Bell Tower. Other sites include the Ponte Vecchio, Vasari’s Corridor, medieval towers, the beautiful Signoria square, other important monuments and more. 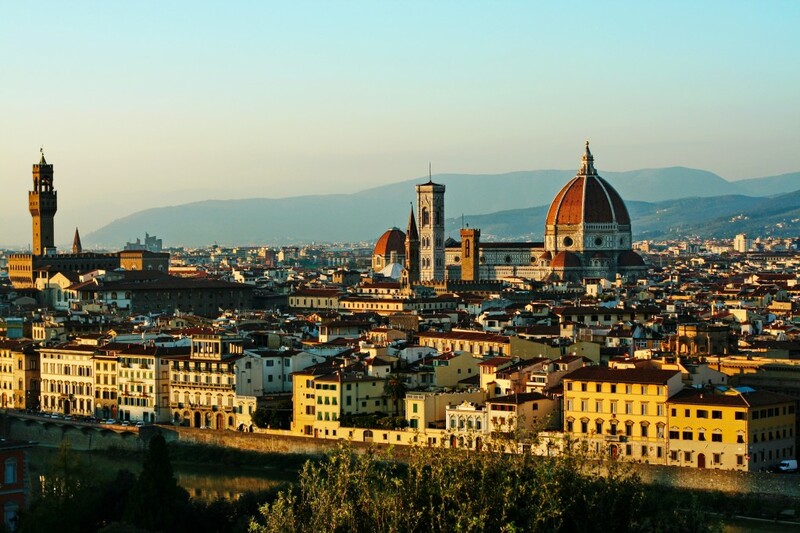 Hear about the history of Florence, its famous artists and rulers, as you stroll by Renaissance palaces, beautiful piazzas, markets and famous shopping streets. This private Florence tour also include a visit to Accademia (prior reservations required). The Accademia has some of Michelangelo’s important works that include the famous Statue of David. A lunch reservation is included. NOTE: Free time to explore longer is possible when you opt to travel by train on your return to Rome. Optional tour with or without a guide: Inside visit the Uffizi Gallery. The Uffizi gallery occupies the top two floors of a building originally designed by Giorgio Vasari, a leading 15th century architect. Today, it is one of the most famous and important art museums in the world. In this Uffizi tour, you will see the Uffizi’s acclaimed masterpieces by Botticelli, Fra Angelico, Felippo Lippi, Raphael, Michelangelo, Caravaggio, Giotto, Leonardo da Vinci and many others. German, Flemish and Dutch masters like Rubens and Rembrandt are also well represented.